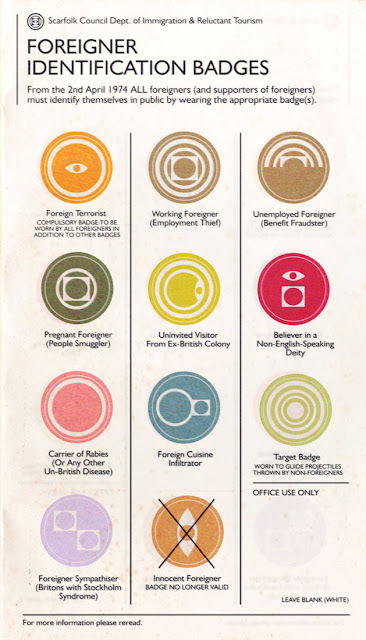 I hope that you're just really quick at making these as the alternative is that you have a file full of "Scarfolk ideas for if the UK government gets *really* fascist" and you're just picking them off the shelf. Wow, can I have permission to knock up a few of these for me and my friends? I suspect there's a fair few sympathisers amongst us and we may want to visit one day (assuming we're welcome)? We are working on making these badges commercially available.. If this document adorned a t-shirt, I for one would buy it pronto. If this document adorned a t-shirt, I'd buy it pronto. A few of these in the traditional felt would be great. I would wear my Foreigner Sympathiser and Foreign Cuisine Infiltrator badges with honest delight. was this funded in any way by donald trump? Could you please create a set for America? We'll need them by early January. Don't forget that Freedom of Speech will have a limited shelf-life after the inauguration.